The great value pack combines three of the best San Francisco experiences into one. Start with the San Francisco Hop-On, Hop-Off Tour which consists of 3 loops: a Sausalito Tour, Official City Tour and the San Francisco Night Tour, all via open-top buses. Plus, this package includes the most sought-after tickets in San Francisco - ferry and admission tickets for Alcatraz - the notorious prison which was home to the likes of Al Capone, George “Machine Gun" Kelley, and Robert "The Birdman" Stroud. But that's not all! We have also thrown in a ticket to Madame Tussauds! This fantastic Hop-On, Hop-Off Tour covers the very best of the city and gives you 2 days to explore all San Francisco has to offer. Sit back and enjoy fantastic views from the top deck of an open-top bus. When you get to a stop that interests you, hop-off and explore. The Official City tour loop takes you to all main sight of San Francisco, including the Golden Gate Park and North Vista Point – with the best view of the Golden Gate Bridge. Sausalito loop takes you over the bridge to enjoy the view and to explore charming Sausalito and you can even take a Night Tour to see San Francisco after dark! Cruise to Alcatraz Island where your ticket includes the award-winning audio tour in the prison cell house with actual interviews with former guards and inmates. Alcatraz tickets are in high demand and the US National Parks service only issue a limited number per day. We advise you to book well in advance to avoid disappointment. Hop-On Hop-Off Tours run between 9:00am and 5:00pm. Alcatraz : Can be any time between 9:00am and 5pm, Due to the high-demand for these tickets we will only be able to confirm the precise time and date after your booking is completed. Night Tour: 1.5 hours to 2 hours approx. Alcatraz Island: Your ticket will be valid for a date and time. See the notes section for more info. Tickets must be exchanged before boarding the bus at 2724 Taylor St Suite B, San Francisco, CA 94133, USA. You may board the bus from any of the stops. Alcatraz, you must pick up your Alcatraz tickets from Fisherman’s Wharf between 8:00am and 10:00am on the day your Alcatraz tour is booked for. Alcatraz: Ferries back to Pier 33 Fisherman’s Wharf depart approximately every half hour throughout the day. The fantastic Alcatraz and hop-on, hop-off combo covers the very best of the city and grants 48 hours to explore all it has to offer. San Francisco’s main attractions such as Fisherman’s Wharf, Civic Center, Union Square, Chinatown, Golden Gate Bridge, and Pacific Heights, this tour is perfect introduction to San Francisco. You may hop-on and off at any of the designated 25 stops to sightsee, shop or eat. You may hop-on and off at any of the above mentioned stops at your convenience and then hop back again when the next bus comes along. The Night Tour starts from the Fisherman’s Wharf. With spectacular views from the top of an open top Double Decker bus, the tour covers all major sites of San Francisco and visits the most popular areas, such as Fisherman’s Wharf, Union Square, Financial District, the Embarcadero, Chinatown, North Beach, and Nob Hill with its impressive Grace Cathedral and the unforgettable views from Treasure Island of Bay Bridge and San Francisco skyline. For your exciting Alcatraz tour, collect your ticket from the Fisherman’s Wharf between 9am and 10am and depart on a ferry from Pier 33. The ferry across the San Francisco Bay takes about 10 minutes. Alcatraz Island is a 25-acre island located just 1 ¼ -miles from San Francisco's Fisherman's Wharf. Upon arrival, a National Park Ranger will provide a brief welcome and orientation. You are then free to explore the island and the prison at your own pace. We recommend that you stop at the theatre to see the Alcatraz video following orientation. The video provides an excellent overview of what you will see. The 45-minute audio headset tour of the Alcatraz cell block is a real highlight. This tour is available in six languages: English, French, German, Italian, Japanese and Spanish. During the tour, you will hear stories from former inmates and prison guards as you walk through the cellblock. After the Cell Block tour, there is time to see all the sites around the island and visit the Alcatraz museum and bookshop. To reach the Cell House, walk from the wharf up the steep hill on old service road. The Cell House is at the top of the island. Along the way, you can stop and visit exhibits, see a variety of prison, and enjoy the views. Another option is to walk along the Agave Trail. The trail begins near the ferryboat landing on the east side of Alcatraz Island and continues to the southern tip of the island. The Agave Trail passes through a protected bird sanctuary and features beautiful plants and flowers. This trail offers fabulous views of San Francisco and the Golden Gate Bridge. You can stay as long as you wish on Alcatraz. Ferries back to Pier 33 Fisherman’s Wharf depart approximately every half hour throughout the day. The departure time for the ferry to Alcatraz will be provided to you upon redeeming your voucher. Also, you will get FREE Ticket Madame Tussauds. Your ticket is not open dated. The date you enter at the time of booking will be the date your Alcatraz reservations are made for. We cannot guarantee Alcatraz tickets for any particular time. You need to go to the local activity operator’s office at Fisherman’s Wharf between 09:00am and 10:00am on the day of your visit to collect your tickets which will have a fixed time on them. (Regrettably we are unable to honor special requests for specific times). Voucher information: Sorry, but we will need you to print a paper version of your booking voucher (we're working on changing this). At this time no refund can be given for customers without a printed version of their voucher. Please bring a government-issued photo ID on the day of your tour. 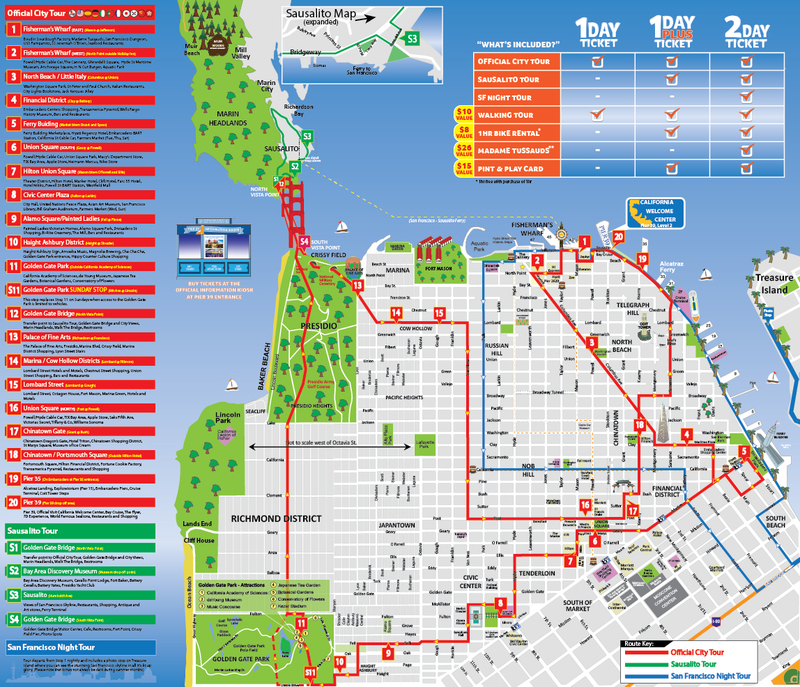 San Francisco is a functioning city and therefore political events, demonstrations and celebrations can disrupt the route at any time, especially during summer and at weekends. On Thanksgiving Day, Christmas Eve, and New Year's Eve last Hop-On Hop-Off Tours will depart at 4 PM (instead of 5 PM) and the Night Tour will not be running. The confirmation voucher includes the local activity operator’s contact details and local telephone numbers at the destination. They will happily answer any logistical questions you may have.Wheelchairs can be collapsed down and stored on the bus but the buses are not equipped with ramps and therefore passengers would need to walk up 2 steps. Great tour to Alcatraz, bus tour was very useful for getting to know San Francisco.